The best way to describe this Regal 322 is that there is alot of boat for the money, as a project boat it still needs a little more but is capable of getting out there and cruising the local waters right now. This is a unique opportunity and one I think will be snapped up quickly. 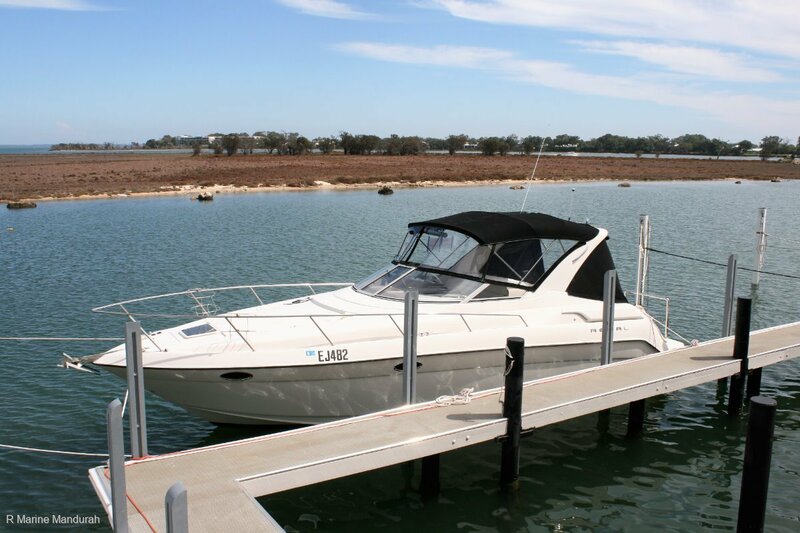 A large volume cruiser with plenty of room for the family to spread out and enjoy the day. Plenty of seating in the cockpit and all with fresh upholstery, pair this with the fantastic condition of all of the canopies overhead and there has already been plenty done. An extremely roomy cabin layout with a large forward berth and even larger aft berth allows the whole family room to move and relax on board. The cabin facility is big even for my 6 foot plus frame offering a great dinette and spacious toilet facility. The galley is a simple affair being a basic preparation area, no Microwave or stove fitted. Perhaps fitting a BBQ to the large Stainless Steel railing on the oversized swim platform will do the job ? This is a unique opportunity and att his price is sure to be taken up soon.